Have you ever tried something just completely different with your craft supply to see where it would take you? That's what I did recently with some Lovebug Creations Rumple Ribbon -- I created a 3-D embellishment with the ribbon itself. To make this sweet heart, I "crocheted" a chain of single stitches using the ribbon as my "yarn." 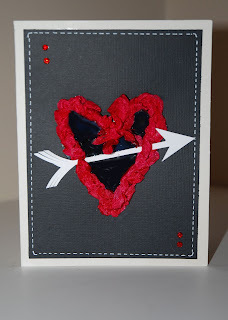 I tied it off in a bow, then laid down a line of white glue in a heart shape, onto a black piece of cardstock. 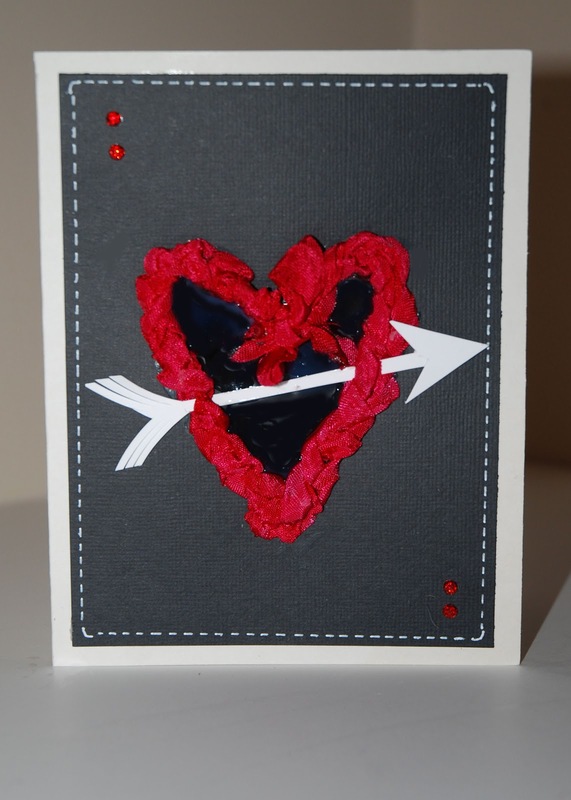 I fussy-cut an arrow that I threaded into the heart, and glued the shape onto the card. I then filled the center of the heart with CTMH Liquid Glass. I finished the card by adhering the black card onto a CTMH Colonial White card, added faux stitching in white gel pen, and added four CTMH glitter gems. Love this Ellen! Great way to think outside of the box!! That's a very innovative way to create something with LBC Rumple Ribbon - I HEART it.......bravo! Love it Ellen, it really pops!